1. Mix all the orange glaze ingredients in a bowl and keep it in the fridge till required. 2. Combine orange juice, brown sugar, vinegar and salt in a bowl. 3. Place the chicken drumsticks in a ziplock bag and pour the orange marinade. 4. Seal the bag and shake well to coat the drumsticks. 5. Keep the bag in the fridge for 2 to 3 hours. 6. Heat a grill over medium flame. 7. Add the butter and place the marinated chicken on it. 8. Brush with the orange glaze and cook for 5 minutes each side. 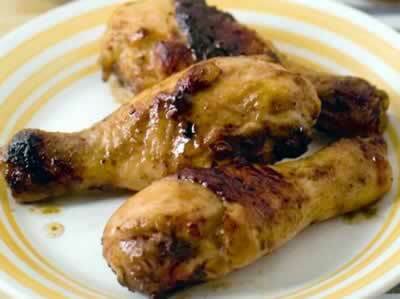 Feel free to comment or share your thoughts on this Orange Glazed Chicken Drumsticks Recipe from Awesome Cuisine.